Named for the two rows of yellow and orange spots speckled along their black backs, spotted salamanders are large members of the mole salamander family. On average, they measure about 18 cm (7 in. ), but they can reach lengths up to 23 cm (9 in.) long! Common in the forests of the eastern United States and eastern Canada, spotted salamanders make their homes in areas that are close to ponds and vernal pools. 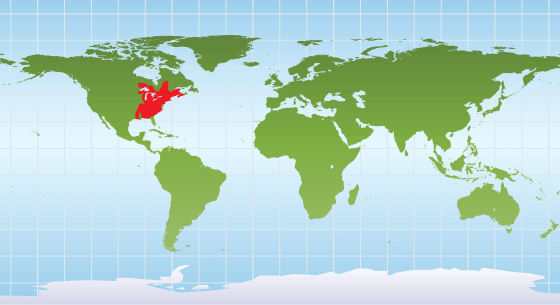 But despite their thriving populations, the dark amphibians are difficult to find. Adults spend most of their day hiding underground or beneath rocks and logs. Venturing out from their hiding spots at night to hunt, they eat just about anything they can catch and swallow, including worms, spiders, insects, and slugs. Spotted salamanders use ponds for breeding. In early spring, they wake from their hibernation and migrate to ponds to mate for several days. They return to the same pond each year. Thousands of spotted salamanders will travel to a breeding pond at the same time. During the breeding period, females lay up to 200 eggs which are encased in a jelly-like coating. The coating helps protect the eggs from predators like fish, turtles, aquatic insects, birds, frogs, and crayfish. A few weeks after being laid, the eggs hatch. Larval spotted salamanders have feathery gills on the outside of their bodies. They live underwater, feeding and growing for up to 4 months. Juveniles lose their gills and climb onto land. When they reach adulthood they are able to breed. Spotted salamanders can live up to 20 years. 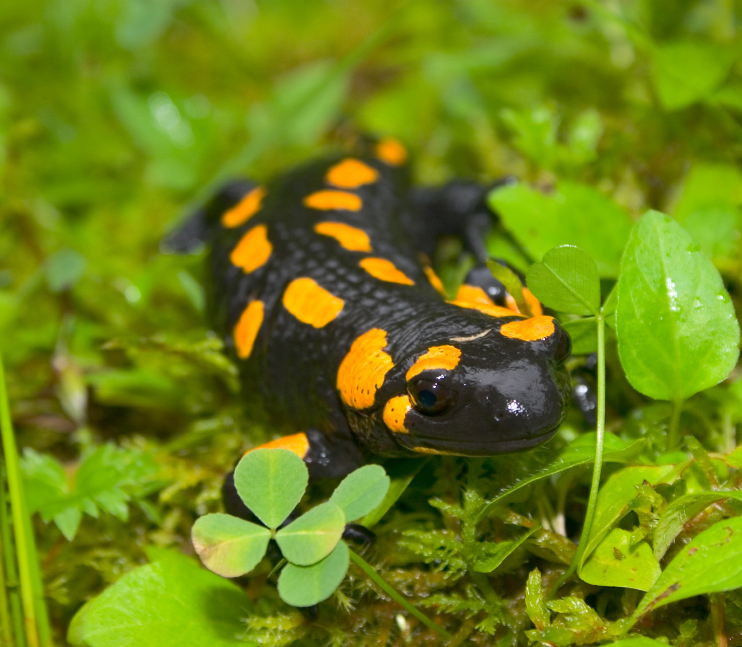 The spotted salamander is listed by the IUCN as a species of least concern. However, development of wooded areas that contain their breeding grounds can put their populations at risk. 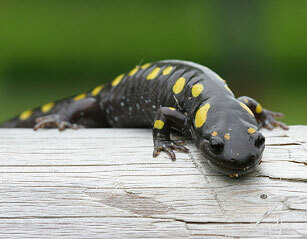 Spotted salamanders are also at risk of being run over by cars when they cross streets to reach their breeding grounds. If you live in an area with a population of spotted salamanders, you can help by keeping an eye out for salamanders that are crossing the road. You can also help preserve forests and vernal ponds in your area. Common in the forests of the eastern United States and eastern Canada, spotted salamanders make their homes in areas that are close to ponds and vernal pools.